The first Cochrane review to examine the products considered two randomised trials with data from 662 current smokers. The review authors, from the UK and New Zealand, said the results needed to be expanded on by other studies. Public health doctors said they remained concerned that the devices could reverse progress on smoking. The trial researchers found that about 9% of smokers who used e-cigarettes were able to stop smoking for up to a year, and possibly longer. That compared with about 4% of smokers who used devices which did not contain nicotine. And in the two trials - regarded as "gold standard" evidence - 36% of e-cigarette users managed to halve the number of conventional cigarettes they smoked, compared with 28% who used placebo devices. There was no evidence of serious adverse effects among people using e-cigarettes. However, the Cochrane review authors cautioned that the results were limited by the small number of trials and the limited sample of participants. 1. On some e-cigarettes, inhalation activates the battery-powered atomiser. Other types are manually switched on. 2. A heating coil inside the atomiser heats liquid nicotine contained in a cartridge. 3. Liquid nicotine becomes vapour and is inhaled. The "smoke" produced is largely water vapour. Many e-cigarettes have an LED light as a cosmetic feature to simulate traditional cigarette glow. One of the review authors, Prof Peter Hajek from Queen Mary University of London, said: "Although our confidence is limited because of the small number of trials, the results are encouraging. "Both trials used e-cigarettes with low nicotine delivery, and it is likely that more recent products are more effective. "Several ongoing studies will help to answer the question more fully." The review was welcomed by the anti-smoking health charity Action on Smoking and Health (Ash), which described the results as "timely". 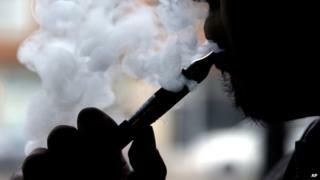 But the UK's Faculty of Public Health vice-president, Dr John Middleton, said: "Our position remains that while e-cigarettes may help smokers who want to quit, we don't yet have enough evidence of the impact they are having on other people. "It has taken decades of sustained effort to create a society in the UK where smoking is now not seen as the norm. "Our concern is that e-cigarettes could reverse this and create a new generation of customers for the tobacco industry."